Two reporters from the state of hockey share their predictions for the 2018 NHL Playoffs. 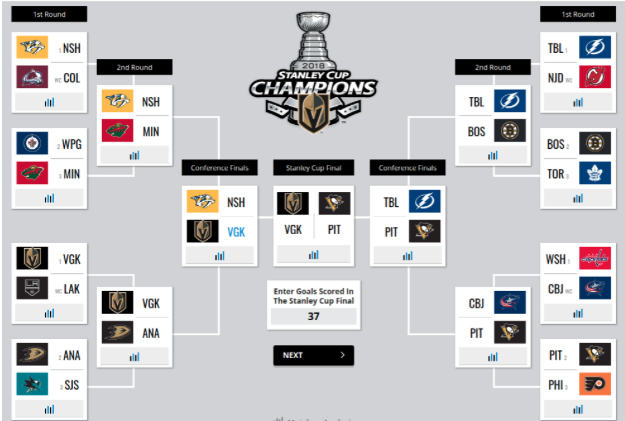 To start off a perfectly executed bracket I chose a obvious favorite, the Nashville Predators. The Predators have been an exceptional team with 7th overall in goals scoring and 2nd overall in goals against. They also clearly are a strong team in the playoffs from being an underdog in every single game all the way to the championship. The next game I chose was the Wild versus Jets game. This was a biased choice because I am a big Wild fan and I can’t cheer against them. The Wild are a consistent team with Eric Staal leading the way with tying the Wild record of 42 goals this season. Going to the Pacific Coast Division the first game is the Vegas Golden Knights against the Los Angeles Kings. A miracle team that was just created this year is somehow killing it with top five in goals forward. The Kings are also a washed team with players like Kopitar that are passed their prime. Vegas will win easy. The Anaheim versus San Jose game was a toss up for me. Both teams are more defensive heavy with San Jose being 2nd in penalty kills and Anaheim 3rd in goals against. In my opinion San Jose has been the hotter team so I chose them. Across the country in the Atlantic Division The number one Lightning are playing the New Jersey Devils. I laughed when I saw the Devils made it to the playoffs because of how mediocre their team has been in the past. I don’t need to argue a side here I got the Lightning in 4 games. I may sound like I don’t know much about the NHL with this next pick but I chose Boston because their city wins national championships in everything all the time. Along with that the team has amazing statistics with 6th in scoring, 4th in goals against, 4th in powerplay goals, and 3rd in powerplay kills. Over to the Metropolitan division the Washington Capitals have choked in the playoffs every single year. I simply can’t take them to win any series because they are untrustworthy. The Blue Jackets are also not that bad of a team being 9th in goals against. In the final series of the opening round I chose the Penguins. The Penguins are one of the top offensive teams being first in power play goals and third in regular goals they should be able to skate all over the average Flyers. Over to the next round. For the Central Division it killed me to pick against the Wild, but the Predators are just too good. They are exceptional in offensive and defensive abilities and they will have no problem sweeping the Wild. Over to the Pacific division the Vegas Golden Knights will have no problem taking down the Ducks. Led by William Karlsson with 43 goals, the Knights will look to be a team that will not only be new but will also be a Stanley Cup contender. In the Atlantic Division I have the Tampa Bay Lightning winning against the Bruins. The Bruins may look like a championship caliber team on paper, but the Lightning are a powerful force on offense that should run all over the Bruins. Finally, in the Metropolitan Division The Blue Jackets are not that great of a team. As I said before the only reason they will win their first series is because of the Captains choke every single year. Blue Jackets will easily be swept by Sidney Crosby and the Pittsburgh Penguins. I have to go with the fan favorite here which is the Vegas Knights. This game is a toss up for me because both teams are threats on offense and defense. I have to go Vegas to cheer on one of my favorite players who is a former Wild player, Erik Haula. In the other semi final game between the Penguins and Lightning it’s hard to go against this Penguin dynasty. Sidney Crosby is hands down the best player in the NHL right now and will lead his team to the Stanley Cup championship for a third year in a row. The Penguins are also have the best offense in the league and can easily finish this series in 5 games. On to the big game, The Stanley Cup Final. It was a tough choice for me, either a three-peat for the Penguins or the new expansion team. Vegas is pretty strong in offense and defense, versus the Penguins are the top offense with just an okay defense. For me defense wins championships. I have the Vegas Golden Knights winning the Stanley cup in seven games. With a total goal count of 37 goals between the two teams. Starting off with no surprise at all, the Predators will sweep the Avalanche in four decisive games. The Predators have way too many weapons on offense and with one of the best defenses in the whole NHL, the Avalanche will be blown out in all four games. Next up is Winnipeg and Minnesota. Even though I am from Minnesota, I am actually a St. Louis Blues fan, not a Wild fan. Winnipeg has been under the radar all season and it only makes sense for me to pick them. Laine, Wheeler and Hellebuyck will carry them a long way. Going to the Pacific, I have the Vegas Golden Knights beating the Los Angeles Kings. Vegas has been phenomenal in their first ever season. The brand new team has shocked the world and they will win their first round in six games. In the other matchup, the Sharks and the Ducks face off in the battle of the west coast. Both teams have been very solid all year and I could see this going either way. However, I have Sharks winning because of their veteran leadership. Logan Couture will most likely have a good series. Let’s move to the Eastern Conference and the number one overall seed, the Tampa Bay Lightning. With a 100 point season from Nikita Kucherov and Steven Stamkos doing what he does best, the Lightning will fly by the Devils. I didn’t know the Devils were even in the playoffs to be honest. With the next series, Boston plays Toronto in a matchup the Maple Leafs will want to win bad. Back in 2013, these teams faced off and in game 7, the Maple Leafs were up 4-1 with 11 minutes left in the game. However, they completely fell apart and the Bruins came back to win in OT. The Leafs look to shake the ghosts. I have them winning 7 against the Bruins. In the Metropolitan Division, the Capitals play the BJ’s. Yes, the Capitals usually find a way to choke and lose but this year is different, for real. Alex Ovechkin is going to go off and Braden Holtby is going to stand on his head to have the Caps win in five. While in the other series, the Philadelphia Flyers face off against the defending Stanley Cup Champion, Pittsburgh Penguins. Sidney Crosby is back and is not as good as he was last year. The Penguins will still win this though as the Flyers rely on Claude Giroux way too much. Those are all the first round matchups, let’s move on to the second. I have Nashville versus Winnipeg in the Western Conference Semifinals. While the Predators are the one seed, I have the Jets taking this one in seven games. Two very evenly matched teams will each look to move on to the Western Conference Finals. The Predators will need to rely on P.K Subban while the Jets will need to rely on Blake Wheeler. In the Pacific Division finale, I have the Golden Knights and the Sharks. I think the Sharks will take the momentum from the previous series and beat the red-hot Golden Knights in six games. The Sharks will use their age and veteran ability to carry them to the Western Conference Finals. In the Eastern Conference Semis, Toronto will play Tampa Bay in the battle of the blue. Auston Matthews and Mitch Marner will carry the load offensively and propel the Leafs to the the Eastern Conference Finals. The Lightning have played very well this year and Nikita Kucherov might get MVP, but the Leafs are a very solid team with much better depth. On the other side, the Capitals battle the Penguins in a battle which will go seven games for sure. Sid the Kid vs Ovi, a battle that has gone on for many years and usually, Crosby wins. This time, however, I believe the Caps will get by that difficult 2nd round and beat the Penguins. Back to the West and the Jets vs the Sharks. Two teams that have been quietly good all year and this series will be exciting to watch. I have the Jets pulling it off in seven with Paul Stastny scoring the OT winner in games one, three, seven. I’m being very specific. Connor Hellebuyck will stand on his head to lead the Jets to their first ever Stanley Cup final. In the East, the Capitals and the Maple Leafs face off for a chance to go to the Stanley Cup Final. With, Alex Ovechkin playing out of his mind, he will score 10 goals in a seven game battle that will go down to the wire. Ovi is tired of losing and he will take his Caps all the way to the Final. In this Final, the Capitals will win in a game seven OT. None other than T.J Oshie getting the winner from a pass by Alex Ovechkin. The Caps take the Cup and Washington D.C. will be in hype mode. The Jets have battled hard all year, but it’s Ovi’s time and he is not going to let anyone take it.